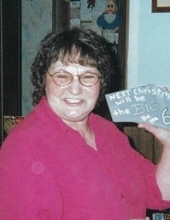 PITTSFIELD-Marie Rose Dewey, 72, died peacefully on Friday, February 1, 2019, in Bangor. Marie was born on February 23, 1946, in Waterville, Maine, the daughter of Wallace and Lillian (Dechaine) Robar. She leaves behind a special family that absolutely loved and adored her. A private family committal will be held in the spring at the Village Cemetery in PIttsfield. To send flowers or a remembrance gift to the family of Marie Rose Dewey, please visit our Tribute Store. "Email Address" would like to share the life celebration of Marie Rose Dewey. Click on the "link" to go to share a favorite memory or leave a condolence message for the family.